For the last several decades, Westerners have been looking East for new approaches to health care. What was once the exclusive domain of hippies and New Agers has become mainstream, as millions of Americans now get acupuncture treatments or practice yoga as a way to heal and prevent illness. One Eastern discipline gaining attention among some health professionals is a mind-body practice with roots in ancient Chinese culture. The practice is called Falun Gong. 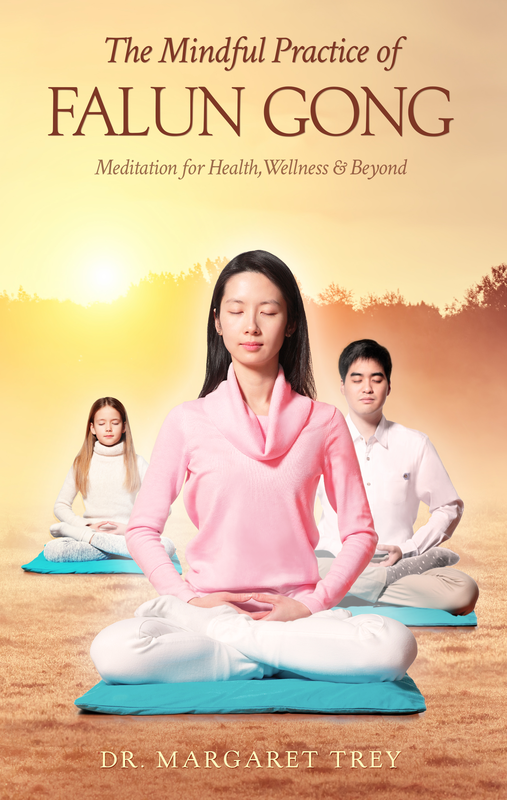 In a new book, “The Mindful Practice of Falun Gong: Meditation for Health, Wellness, and Beyond,” author, researcher, and counselor Margaret Trey discusses what research has to say about Falun Gong’s healing potential, and explores her own experience using the practice in counseling. A new book by Dr. Margaret Trey looks at what science has to say about the health effects of Falun Gong. Since the 1970s, psychotherapists have used Buddhist teachings as a way to help patients manage stress and alleviate physical and emotional pain. Trey noticed that Falun Gong could have similar benefits. For many generations, Falun Gong was a secret practice passed from master to student before being introduced to the Chinese public in 1992, according to introductory materials to the practice. It was never intended to be used as therapy. Like Buddhism and Taoism, Falun Gong primarily serves as a path to enlightenment, adherents say. Thus, practitioners spend time sitting in meditation; practicing slow, gentle exercises; and striving to meet a high moral standard in their everyday lives. 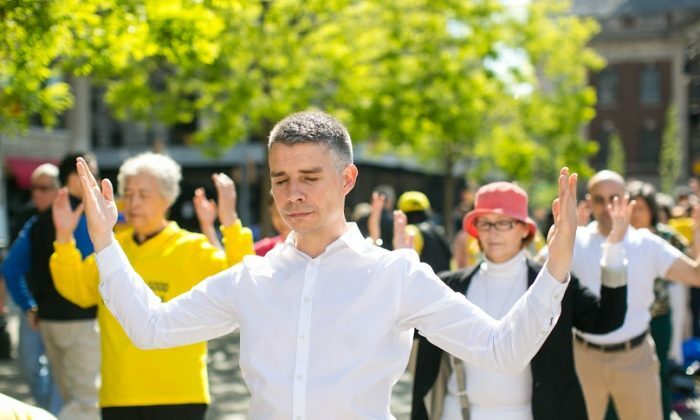 However, since Falun Gong directly addresses issues such as clearing the cluttered mind and overcoming the human inevitability of suffering, Trey finds that applying Falun Gong concepts in counseling can offer valuable guidance to lost or wounded souls seeking clarity and understanding. “A lot of my cases are anxiety disorders. Getting them to do Falun Gong exercises in the counseling session actually helped them to calm down. I don’t know how it happens. I just know that it helps them,” she said. One example Trey mentions in her book is a client named April (a pseudonym). 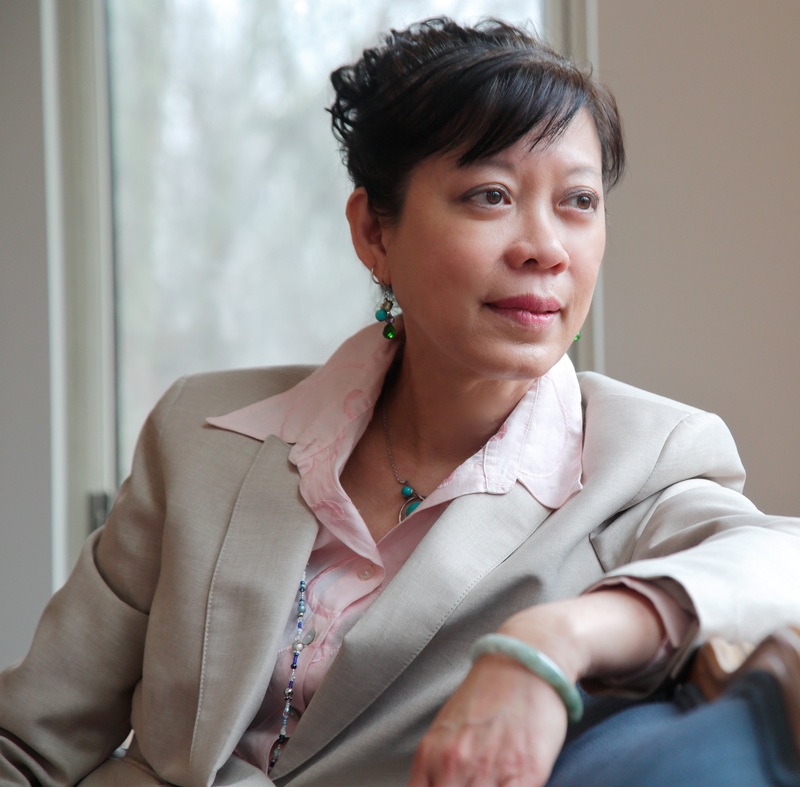 April was plagued by anxiety, but she found that Falun Gong could immediately quiet her busy mind. “I feel more relaxed, less anxious, and [have] less stuff buzzing in my head,” April said in an interview with Trey. According to Trey, April was able to defeat “her inner demons one by one through counseling integrated with Falun Gong.” As a result, her confidence and self esteem grew, allowing her to overcome painful memories from her childhood. April’s therapy tapered off 15 years ago, but she still continues to practice. “Falun Gong is never far from my mind,” she wrote in a recent letter to Trey. Unlike April, most of Trey’s clients don’t go on to adopt Falun Gong practice. However, Trey says that integrating some elements of Falun Gong during appropriate times in a counseling session has helped many make breakthroughs and reach insights that were previously elusive. Another of Trey’s clients, Oskar (not his real name), presented a lot of problems that typical counseling techniques couldn’t touch. Oskar was an adult in his 30s but had the mental age of an adolescent and a history of aggressive, even violent behavior. As his treatment progressed, Oskar told Trey about an argument he had had with his girlfriend. During the altercation, his girlfriend threatened to leave him, so he grabbed a kitchen knife to stop her. But as he recalled something he learned from Falun Gong, Oskar reconsidered his action. Falun Gong isn’t a treatment strategy like cognitive behavioral therapy—and it is not appropriate in severe mental illness—but it can be used in the clinic alongside more conventional techniques, Trey says. According to Trey, Falun Gong makes a complement to Rogerian-style counseling. “Rogerian philosophy is a counseling approach with three principles: empathy, unconditional positive regard for the client, and congruence during practice. I immediately saw how the three principles of the Rogerian technique correlate with the three principles of Falun Gong: truthfulness, compassion, and forbearance,” she said. While Trey’s experience finds that Falun Gong may be good for mental health, evidence shows that it may also be beneficial to physical health as well. To examine the healing potential of Falun Gong, in 2007 Trey conducted a pioneering study known as the Australian survey. The survey was developed as part of her doctoral dissertation at the University of South Australia. It compares the health and wellness effects of Falun Gong as perceived by practitioners measured against a control group of non-practitioner participants. The results strongly suggest that practicing Falun Gong has a positive effect on both physical and emotional health. In designing her study, Trey looked to researchers who had considered health effects with other spiritual disciplines. One such influence is Dr. Harold G. Koenig, director of the Center for Spirituality, Theology and Health at Duke University. The prolific Koenig has published over 400 scientific, peer-reviewed publications and 40 books on various medical subjects, but he’s best known for his insights on religion. Koenig’s controlled trials show that practicing religion and spirituality actually helps people improve their health and well-being. The Australian survey reveals that Falun Gong practitioners rarely take medication or see a doctor, yet this group scored much higher than the non-practitioner control group in every health metric. “Before they started practicing, the Falun Gong group had a lot more health and medical problems than the non-Falun Gong group. After practice, they reported significant improvement in their condition,” Trey said. According to Dr. Heather Mattner, a health psychologist and adjunct professor at the University of South Australia who served as an advisor to Trey, the Australian survey demonstrates the powers of stillness, peace, and awareness for those who practice Falun Gong. 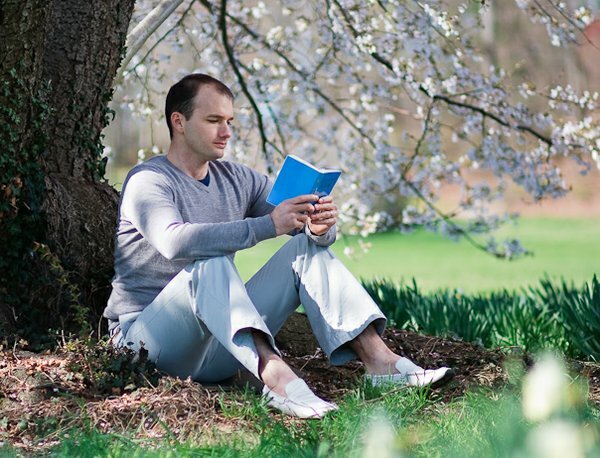 “[Trey’s] study indicates that Falun Gong brings important benefits for many individuals suffering illnesses, compromised mental health, and chronicity, in safe, sound, and satisfying ways that defy medication and typical curative processes,” Mattner wrote in a forward to Trey’s book. According to Dr. John Court, a retired professor from the University of South Australia who served as program director to Trey when she was designing the Australian survey, Falun Gong demonstrates the same underlying values found in all spiritual traditions. “We should not be too surprised that strong benefits are reported, since the processes involved in practice are similar in many ways to other transpersonal and behavioral approaches, and strengthened by some careful advantages (regular practice, variety of strategies, emphasis on personal empowerment and moral improvement,)” Court wrote in a forward to Trey’s book. Although Falun Gong research is still in the preliminary stages, the studies available thus far present a similar picture to Trey’s survey. For example, in a 2005, peer-reviewed study of Falun Gong, published in the online journal of the American Counseling Association, a team of U.S. medical doctors found superior gene expression and improved immunity among Falun Gong respondents compared to non-Falun Gong respondents, indicating that Falun Gong could influence gene expression, enhance immunity, balance metabolic rate, and promote cell regeneration. In the most recent study on the practice, published as an abstract for the American Society of Clinical Oncology’s annual meeting in 2016, 97 percent of cancer patients reported complete symptom recovery after practicing Falun Gong. The average time for symptom recovery was 3.6 months after starting the practice. Earlier this year, Trey was invited to do a 90 minute presentation on her approach to using Falun Gong in counseling and psychotherapy for the American Counseling Association—the biggest counseling organization in the world. She says the support she received from colleagues has been tremendous. Trey is continuing her research of Falun Gong with a new project she calls “Hearts Uplifted,” which looks at case studies of individual Falun Gong practitioners and their miraculous experiences with healing and perseverance. In the future, she hopes to see Falun Gong put to the test in randomized controlled trials, similar to evaluations of yoga. Trey’s work also has an unintentional political edge. While China conducted its own surveys demonstrating remarkable health and wellness effects of Falun Gong in the late 1990s, the reputation of the practice suffered a devastating blow in 1999, when then Chinese dictator Jiang Zemin waged a brutal campaign against Falun Gong in an effort to eradicate it from the country. To justify the torture and imprisonment of Falun Gong practitioners, the discipline was labeled a cult, and the regime spent years disseminating anti-Falun Gong propaganda designed to demonize the practice. Though these ideas were discredited years ago, Trey expects that one likely outcome of her research is that a more complete picture of the Falun Gong phenomenon will emerge.